A 19 year old male presented with complaints of diminution of vision in right eye. He had undergone cataract surgery in right eye elsewhere 6 years ago for firecracker injury. On examination, eccentric pupil is noticed with intraocular lens (IOL) opacity. on dilatation, rest of the intraocular lens is clear. As the rest of the IOL, which was protected by iris, was noted to be clear, the opacification at pupillary area suggests it to be secondary to air bubble contact .IOL exchange was done and explanted was tested and got confirmed as hydrophobic material. There are cases reports of IOL opacification post intra cameral air injection in hydrophilic lenses, to our knowledge this is the first case report of IOL opacification in hydrophobic lenses. with this case report we want to highlight the fact that one should be careful before intracameral air injection in eyes with both types of IOL. Intraocular lens opacification is a serious but rare problem that may necessitate exchange of the lens. Type of opacification is typical to the material intraocular lens (IOL) is made of. In this report, we describe a distinct kind of opacification in a hydrophobic IOL due to intracameral air injection following posttraumatic cataract surgery. A 19-year-old male presented with complaints of diminution of vision in the right eye (RE) both for distance and near. He had undergone cataract surgery in the RE elsewhere 6 years ago for traumatic cataract following firecracker injury. His best-corrected visual acuity in RE was 6/60 and in the left eye (LE) was 6/6. On slit-lamp biomicroscopic examination in the RE, he had peripheral anterior synechiae at 11'o clock position with pupillary peaking [Figure 1] intraocular lens (IOL) glistening involving only the eccentric pupillary area [Figure 2] as confirmed following a dilated examination [Figure 2]. The rest of the anterior and posterior segment findings were within normal limits. LE anterior and posterior segment examination was unremarkable. As the rest of the IOL, which was protected by the iris, was noted to be clear, the opacification at pupillary area suggests it to be secondary to air bubble contact. He underwent IOL exchange in the RE. A three-piece polymethylmethacrylate IOL was placed in sulcus. Optic capture was done to prevent iris rubbing and pigment dispersion. Inferonasal sphincterotomy was done to shift pupil centrally. IOL was noted to be hydrophobic. Explanted IOL maintained its flexibility even after drying up, suggestive of hydrophobic material. Explanted IOL was confirmed as hydrophobic material by an IOL manufacturer. Post operative vision: RE: BCVA: 6/9. 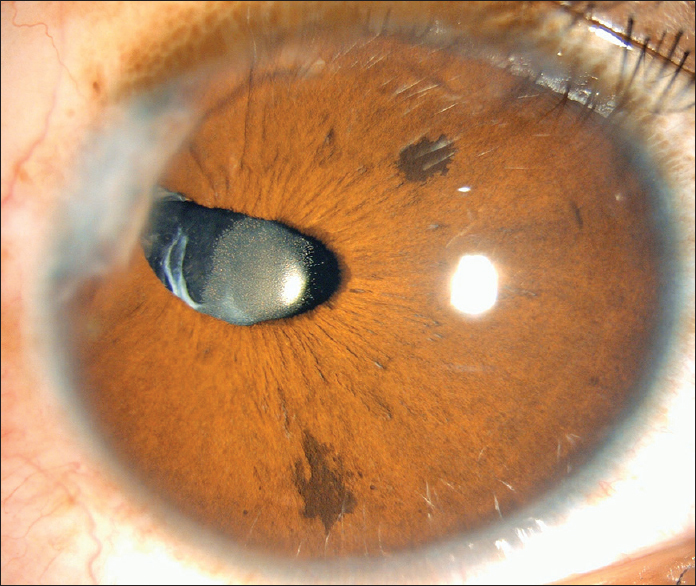 Intraocular lens opacification is rare but can be associated with significant loss of vision. Opacification pattern is peculiar to the material used for lens. Silicone IOLs are associated with brownish discoloration, hydrophobic IOLs are known for diffuse glistening pattern, and hydrophilic IOLs for superficial opacification due to calcium deposits. In our case of hydrophobic IOL, a distinctive pattern of opacification limited to superficial surface that is defined by eccentric pupil margin is seen. IOL opacifications of similar pattern were reported in hydrophilic lenses following air injection in anterior chamber for Descemet stripping endothelial keratoplasty/Descemet membrane endothelial keratoplasty  and air injection associated with surgery posttrauma. None of these cases were associated with hydrophobic IOL. With this case report, we want to highlight the fact that one should be careful before using intracameral air injection in eyes with both types of IOLs. New PHS  polymer (copolymer of three different monomers PEG-PEA/HEMA/styrene), with less incidence of glistening, can be considered in these cases which need air injection. A possible hypothesis is that the presence of intraocular gas in the anterior chamber could induce changes in the surface of hydrophobic IOL with the pupil margin limiting the area affected. This may increase its permeability to aqueous and its entrapment. More research for the development of a better IOL material devoid of these secondary changes is needed. Koch DD, Heit LE. 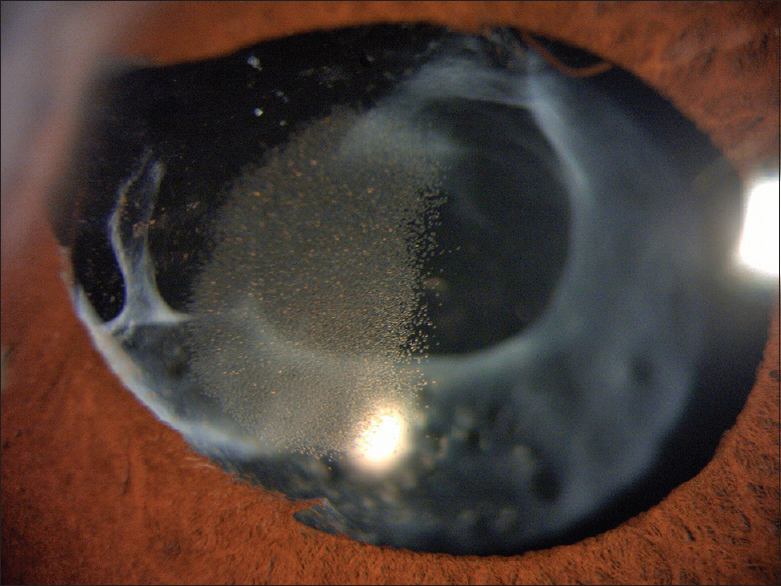 Discoloration of silicone intraocular lenses. Arch Ophthalmol 1992;110:319-20. Werner L. Glistenings and surface light scattering in intraocular lenses. J Cataract Refract Surg 2010;36:1398-420. MacLean KD, Apel A, Wilson J, Werner L. Calcification of hydrophilic acrylic intraocular lenses associated with intracameral air injection following DMEK. J Cataract Refract Surg 2015;41:1310-4. Dhital A, Spalton DJ, Goyal S, Werner L. Calcification in hydrophilic intraocular lenses associated with injection of intraocular gas. Am J Ophthalmol 2012;153:1154-600. Tetz M. New hydrophobic IOL materials and understanding the science of glistenings. Curr Eye Res 2015;34:1-13.